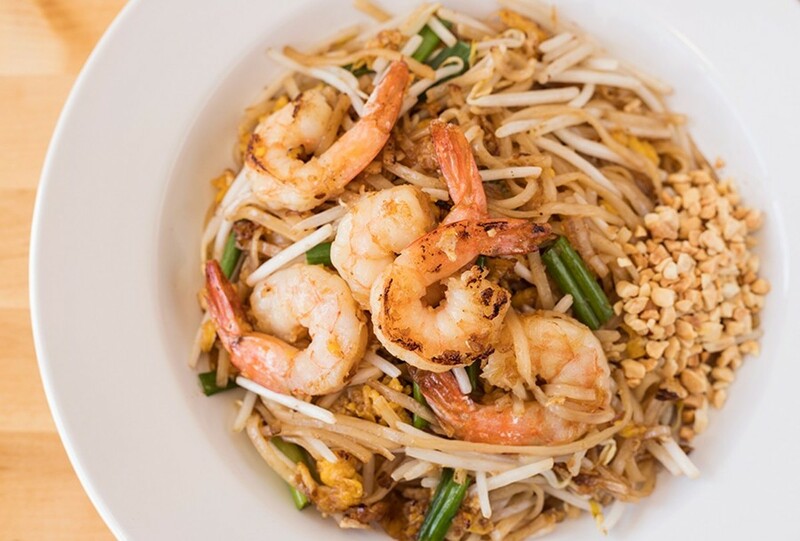 Thai Table's pad Thai isn't red, but that’s a good thing. Natthinee "Joy" Hughes insists that, no matter many times you have dined at a Thai restaurant, chances are you've never eaten pad Thai. It's a bold statement. To American diners, the ubiquitous noodle dish is almost synonymous with Thai cuisine. Glancing at Thai Table's platter of ribbon-like noodles, slicked with light brown sauce, you may understand her assertion. Unlike other versions around town, Hughes' pad Thai is not red, a difference in color that results from the absence of paprika. As she explains, paprika is not used in the traditional preparation of the dish, so she doesn't use it. 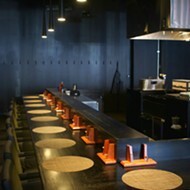 But it's not just its hue that differentiates the pad Thai at Thai Table from the rest. 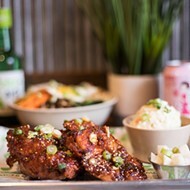 Here, there is only a whisper of the sweetness that is characteristic of American-style preparations; the umami bomb of soy and the complex funk of the fish sauce are its dominant flavors. Fried egg provides added richness, and bean sprouts, green onions and crushed peanuts add crunch. If this is authentic pad Thai, as Hughes insists, it's a revelation. Hughes did not set out to revolutionize how St. Louis views Thai cuisine; she simply wanted to serve local diners the food she loves to eat. A talented home cook, Hughes learned how to make traditional Thai food from her grandmother, developing a reputation as the cook in the family from an early age. Though she had a talent for cooking, Hughes did not pursue that path professionally until she moved to the U.S. six years ago. In need of work, she took a job in the kitchen at the Blue Elephant in Clayton before moving on to other area Thai restaurants, including Basil Spice. All the while, she lamented just how different the dishes she was being asked to make were from the ones she'd loved in Thailand — and the ones she continued to make here in her home kitchen. 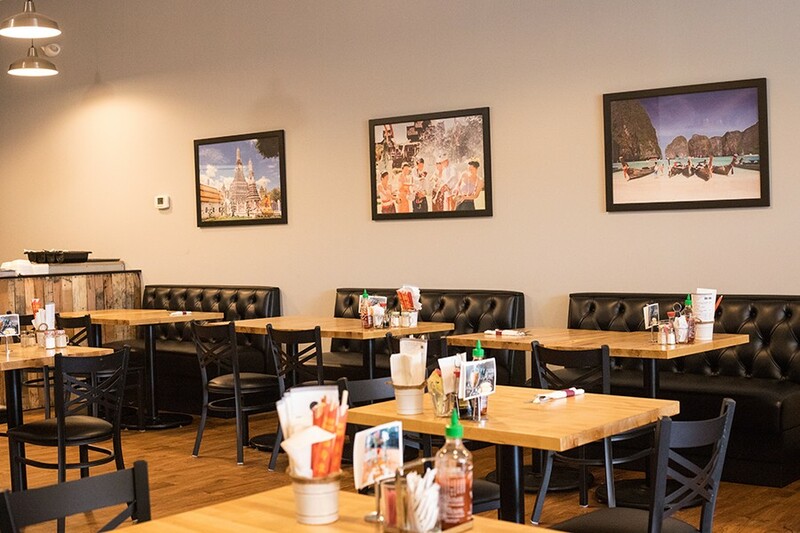 While looking for a job closer to her home in Maplewood, Hughes noticed the city's lack of Thai restaurants. It gave her an idea: Instead of working for someone else, why not open a restaurant of her own? Going into business would not only allow her to immerse herself in her love of cooking; it would give her the chance to do so on her own terms. 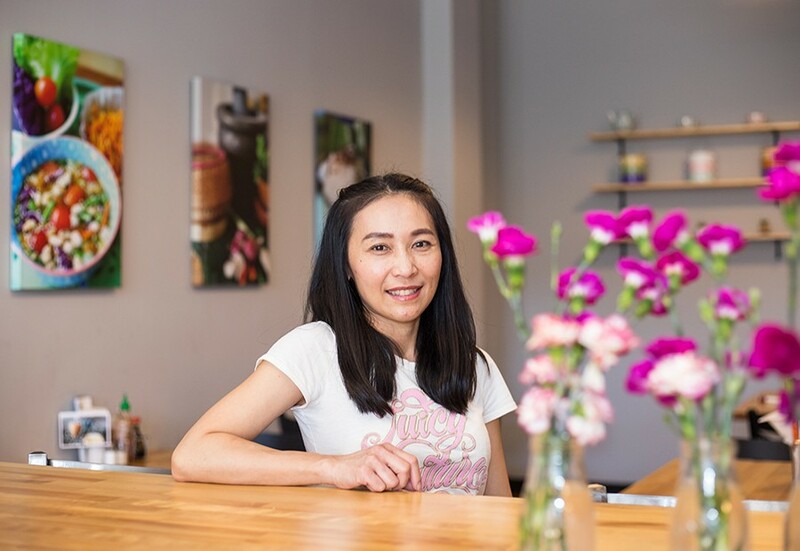 She opened Thai Table last September near the corner of Manchester and Sutton, in one of the storefronts built out from the former Monarch space. The moderately sized open room has a polished feel, with sleek wood floors, pale gray-blue walls and tufted black-leather banquettes. Large, framed photos of Thailand — everything from street food to landscapes — hang on the walls. 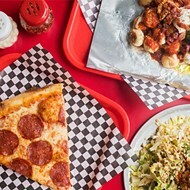 Though the restaurant does not currently serve alcohol (something Hughes hopes to change in the future), a small bar sits in the back of the restaurant, serving as a very busy takeout counter and offering a view of the bustling kitchen. Hughes' pad Thai is just one delight in a parade of dishes that will make you rethink Thai food. Som tum, the popular green-papaya salad, is positively electric. Thin slices of the fruit are paired with shredded carrots and grape tomatoes, then tossed in tamarind, lime and Thai chiles. Do not let the fruity base of the salad fool you; this som tum is searing hot, but so bright and flavorful it lights up the palate. It's like fireworks going off in your mouth. Thai Table's "Summer Rolls" are equally thrilling. Crisp shredded vegetables and silken vermicelli noodles are stuffed into a rice-paper wrapper. On their own, they are outstanding, but the accompanying dipping sauce makes them transcendent. Though delicate in texture, the condiment's chile and cilantro-forward flavor is mighty. Verdant, tart and fiery, it lights up the mouth from the tip of the tongue to the back of the throat. 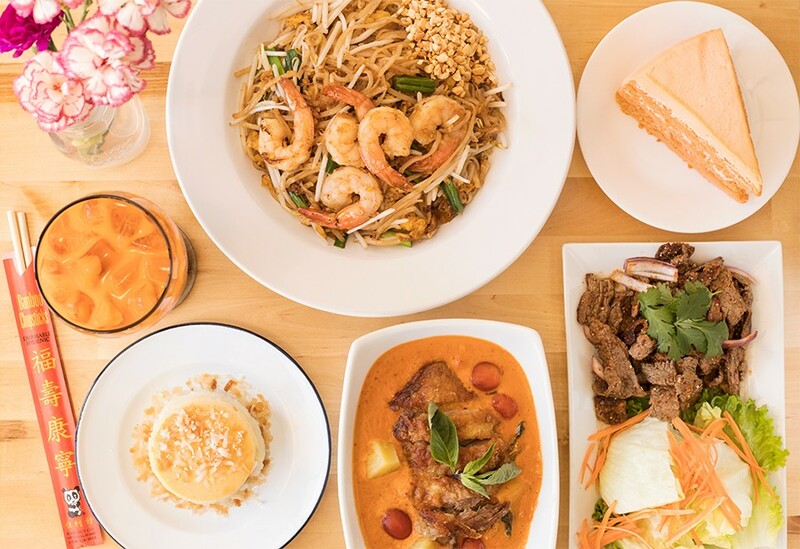 Thai Table offers terrific renditions of everything from pad Thai to sticky rice with Thai custard. Another condiment, billed simply as "dumpling sauce," also makes the ka nom jeep appetizer. Even without it, the pork and chicken dumplings have a wonderfully complex flavor, the result of shiitakes and chestnuts added to the mixture. However, the glorious nectar that accompanies the savory pillows is otherworldly. The thick, dark brown sauce tastes like a reduction of brown sugar, soy, molasses and garlic, forming an intense, syrupy glaze that's like a rich, salty exclamation point. Even if you don't order the dumplings, ask for this sauce and pour it onto anything in sight. 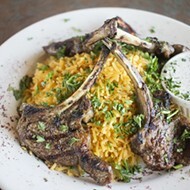 Then again, you won't want to mess with Hughes' already-perfect cooking. Vibrant lab kai, a plate of ground chicken spiked with lime, chiles, red and green onions and cilantro, is wipe-your-forehead spicy, but the flavors are so addictively sour you still can't stop eating it. It's mercifully served with pieces of iceberg lettuce and sticky rice to help mitigate the heat. That same delightfully sour taste is prominent in the tom yum kung, a pork, shrimp and mushroom soup that is mouth-puckering tart and spicy up front, but softens to a sweet finish that tastes like orange blossom. Tom kha kai, Thai Table's other soup offering, isn't as spicy, but its coconut, lime and lemongrass-spiked flavor is just as powerful. Thai Table also excels in its noodle offerings. Like the pad Thai, pad see ew is less sweet than the usual preparation. The reduction in sugar puts the spotlight on the funky black bean sauce and fried egg. Pad kee mao features the same flat rice noodles as the former, but with the zing of bell peppers. Thai chiles tingle the tongue, while whole grape tomatoes offer a pop of refreshment when bitten. Both dishes are magnificent. 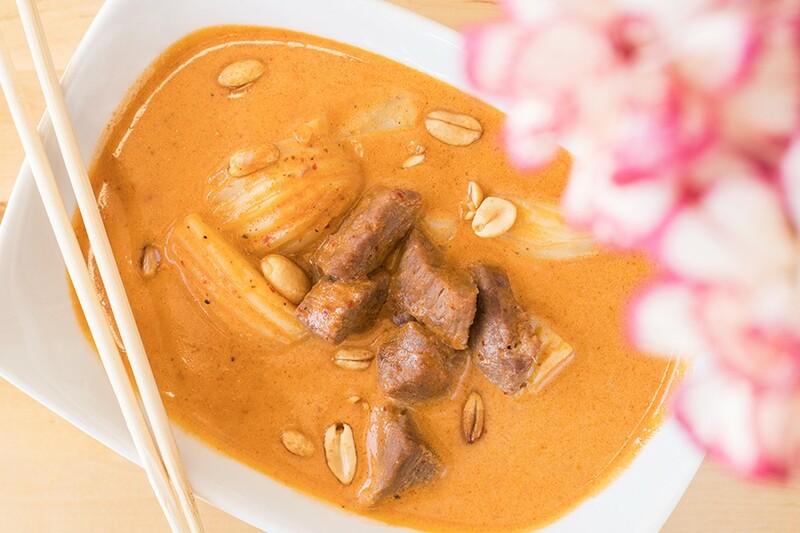 Massaman beef is slow-cooked in curry sauce with coconut milk, peanuts, potatoes and white onions. If the noodles are excellent, the curries are positively ethereal. Massaman beef, with its pull-apart meat and fork-tender potatoes, is like a warmly spiced, lemongrass-scented Thai pot roast. Panang curry, which I ordered with plump shrimp, is like a lovely floral perfume. Lemongrass, garlic and bergamot mingle in a chile-spiked coconut broth; the effect is so vibrant it made my mouth feel as if it was dancing. It's difficult to pick a favorite of the curry dishes, but the ghang ped bhed yang is a standout. Slices of succulent duck, caramelized on the top while rich and fatty under its skin, bob in a spicy coconut milk broth seasoned with lemongrass and chiles. The spice level here has several mitigating components: the fatty duck, the grape tomatoes that burst when pierced and hunks of pineapple that pop with sweetness and infuse the broth with tropical refreshment. There are so many different flavors at play; rather than trying to discern each one, you are better off simply surrendering to this perfect dish. 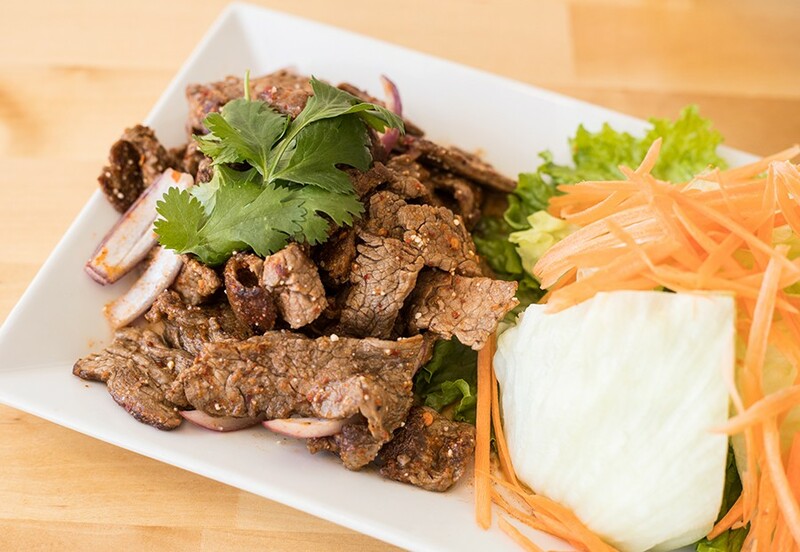 Nam Tok, or flame-grilled sliced beef, is tossed in a spicy lime dressing with toasted rice, red onions, green onions and cilantro. As delicious as the duck curry is, Thai Table's nam tok beef may be its most thrilling dish. Hunks of tender flank steak are grilled as expertly as you'd find in an expensive steakhouse, each piece picking up a delightfully bitter char. After it's pulled from the fire, the meat is finished with a bright lime vinaigrette, then adorned with red and green onions and cilantro. It's straightforward, but the intensely savory yet bright flavor of the citrus-kissed beef is simply masterful. 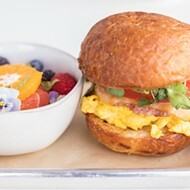 Hughes' talent for savory dishes carries over to sweets as well. Sticky rice, paired with a halved, peeled and scored mango, is finished tableside with warmed coconut milk, a lovely touch that ties the dessert together with soothing sweetness. And Thai custard, served over sticky rice, is a luxurious Southeast Asian riff on flan. Her most delightful dessert, however, is a Thai tea cake so fluffy it was like eating a cloud flavored with sweet tea — a cloud layered with whipped cream so light it dissolved upon hitting my tongue. The cake was so delicate, it jiggled with just the slightest agitation of the plate. This was a special offering on one visit; hopefully it will become a staple of the restaurant's dessert menu. The restaurant’s home is part of the former Monarch space. Even without this delectable addition, though, Thai Table is flawless. Though we are only a few weeks into 2019, I suspect it'll earn a place as one of the best restaurants I visit this year — not that Hughes was going for such accolades. She simply wanted to cook for us the food she loves to eat, the authentic Thai food you'd find in her beloved homeland. Now that we've had that taste, there is no going back.